This is our favorite holiday. 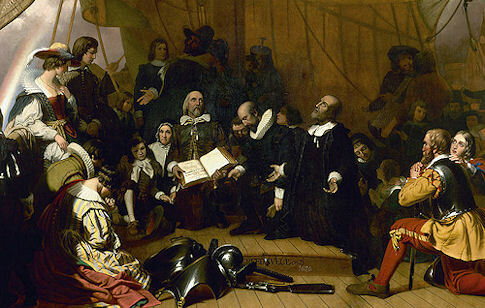 It is America’s very first holiday, when the Separatists (who had come from England to escape religious persecution) had a great feast and gave thanks to God for providing for them: for the abundant and beautiful new land of America; for the Wampanoag Indians who had helped the Separatists survive that first awful winter; for the freedom they all now had to practice the Christian religion according to their conscience. That’s a LOT to be thankful for!! 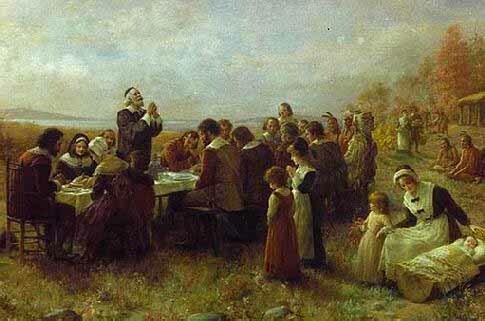 You can read a very good summary of the “Why Do We?…” about Thanksgiving here and the Pilgrim Hall Museum website is here. I have the great honor of descending from one of those men who signed the Mayflower Compact and survived that first terrible winter in Massachusetts. I am grateful to God for His marvelous work. God bless us all! Happy Thanksgiving! I really love the quotes you pointed out- this country WAS founded on Biblical priniciples!